Dr Jengo's World: Marvel Heroes Diary: Apr 7 2014 - Enter The Taskmaster! Marvel Heroes Diary: Apr 7 2014 - Enter The Taskmaster! 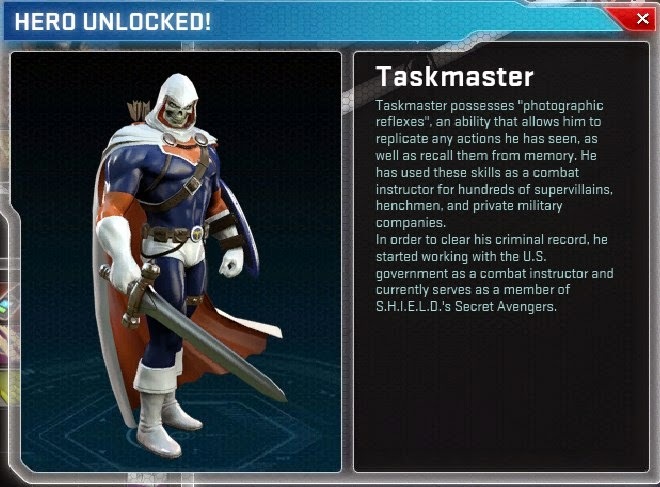 Marvel Heroes introduced the Taskmaster as an April Fools' Joke, which later became a real playable hero! So, essentially he has become the first playable "villain" as well. I purchased him for 200 Eternity Splinters as I didn't have enough Gs for the Bundle Pack. He kinda sucked at first.. his skills are a mash from a couple of other heroes and his basic attacks seem to lack punch. But, as he progressed to the later levels, the better powers started to unlock. I was also very undecided on which powers to use for him as there were plenty of choices to choose from. Should I go all Captain powers and match it with Archers ones for range? Or all melee? Or ranged? What about his own unique powers? Then, I decided to stick to stick true to his style, using different powers from each category; so I decided to go with 1 from each category to support his own main powers. And his 2 mains will be non-spirit spenders, Rending Swings and .45 Caliber. The spirit on hit from Rending Swings will be good to recharge his spirit and I like the extra Brutal Strike Rating on .45 Caliber. I definitely need to play around with different combinations of powers but I think I will stick to having 1 from each category to go with the idea that Taskmaster has stolen powers from different heros. But I have really enjoyed playing him that I think I'll go all out to Level 60 with this guy. Maybe even do a build guide like the one I did for Colossus. Another thing I like about the playable villains is being able to use their own Medallions for them. Suits them perfectly!